Thiepval Memorial – Lest We Forget! The Thiepval Memorial to the Missing of the Somme is a war memorial to 72,195 missing British and South African servicemen, who died in the Battles of the Somme of the First World War between 1915 and 1918, with no known grave. It is near the village of Thiepval, Picardy in France. A visitors’ centre opened in 2004. The Memorial was built approximately 200 metres (220 yd) to the south-east of the former Thiepval Château, which was located on lower ground, by the side of Thiepval Wood. The grounds of the original château were not chosen as this would have required the moving of graves, dug during the war around the numerous medical aid stations. Designed by Sir Edwin Lutyens, the memorial was built between 1928 and 1932 and is the largest Commonwealth Memorial to the Missing in the world. It was inaugurated by the Prince of Wales (later King Edward VIII) in the presence of Albert Lebrun, President of France, on 1 August 1932. The unveiling ceremony was attended by Lutyens. The memorial dominates the rural scene and has 16 brick piers, faced with Portland stone. It was originally built using French bricks from Lille, but was refaced in 1973 with Accrington brick. The main arch is aligned east to west.The memorial is 140 feet (43 m) high, above the level of its podium, which to the west is 20 feet (6.1 m) above the level of the adjoining cemetery. It has foundations 19 feet (5.8 m) thick, which were required because of extensive wartime tunnelling beneath the structure. It is a complex form of memorial arch, comprising interlocking arches of four sizes. Each side of the main arch is pierced by a smaller arch, orientated at a right angle to the main arch. Each side of each of these smaller arches is then pierced by a still smaller arch and so on. The keystone of each smaller arch is at the level of the spring of the larger arch that it pierces; each of these levels is marked by a stone cornice. This design results in 16 piers, having 64 stone-panelled sides. Only 48 of these are inscribed, as the panels around the outside of the memorial are blank. More succinctly, according to the architectural historian Stephen Games, the memorial is composed of two intersecting triumphal arches, each with a larger central arch and two smaller subsidiary arches, the arches on the east-west facades being taller than those on the north-south, and all raised up from what is loosely a square four-by-four tartan grid plan. The main arch is surmounted by a tower. In the central space of the memorial a Stone of Remembrance rests on a three-stepped platform. 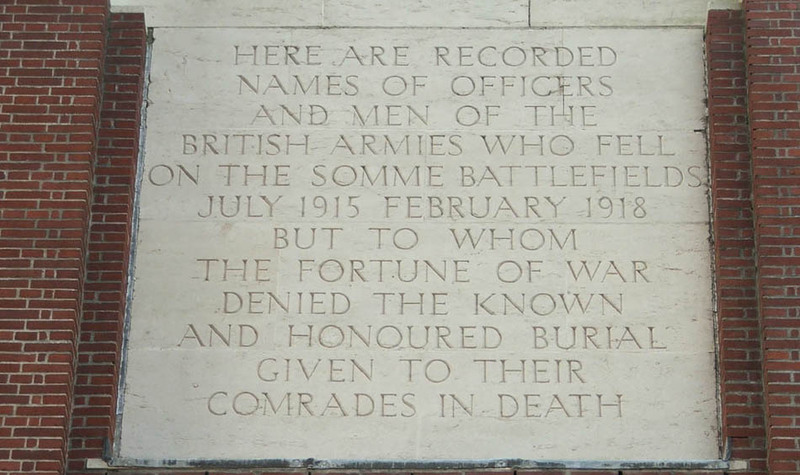 The memorial represents the names of over 72,000 officers and men (see below), and Lutyens’s ingenious geometry arises out of the attempt to display these names in compact form, rather than in the more usual linear form seen in the very long and much lower memorials to other vast First World War battles such as Loos, Pozières and Étaples. On the Portland stone piers are engraved the names of over 72,000 men who were lost in the Somme battles between July 1915 and March 1918. The Commonwealth War Graves Commission states that over 90% of these soldiers died in the first Battle of the Somme between 1 July and 18 November 1916. The names are carved using the standard upper-case lettering designed for the Commission by MacDonald Gill. Over the years since its inauguration, bodies have been regularly discovered on the former battlefield and are sometimes identified through various means. The decision was taken that to protect the integrity of the memorial as one solely for those who are missing or unidentified, that if a body were found and identified the inscription of their name would be removed from the memorial by filling in the inscription with cement. For those who are found and identified, they are given a funeral with full military honours at a cemetery close to the location at which they were discovered. This practice has resulted in numerous gaps in the lists of names. “The Missing … of the Somme”. Seven Victoria Cross recipients are listed on the memorial, under their respective regiments. Irish first-class cricketer William Crozier. Irish economist, poet and former British Member of Parliament Thomas Michael (Tom) Kettle. English first-class cricketer Ernest Shorrocks. The Thiepval Memorial also serves as an Anglo-French battle memorial to commemorate the joint nature of the 1916 offensive. In further recognition of this, a cemetery, Thiepval Anglo-Frenchy Cemetery, containing 300 British Commonwealth and 300 French graves lies at the foot of the memorial. Most of the soldiers buried here – 239 of the British Commonwealth and 253 of the French – are unknown, the bodies having been reburied here after discovery between December 1931 and March 1932, mostly from the Somme battlefields but some from as far north as Loos and as far south as Le Quesnel. Each year on 1 July (the anniversary of the first day on the Somme) a major ceremony is held at the memorial. There is also a ceremony on the 11 November, beginning at 1045 CET.